For Wholesale approved customers only. Order fulfillment will remain pending until confirmation of wholesale status. Contact us via email to apply. Looking for bulk quantities at wholesale prices? 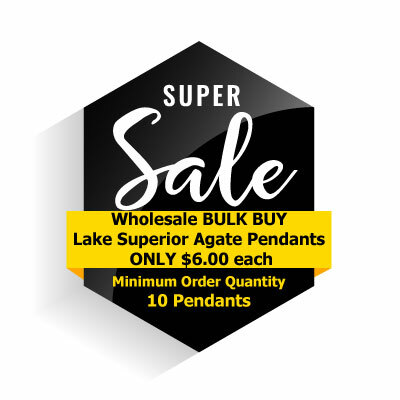 Take advantage of this offer by purchasing 10 or more pendants and get the amazing price of only $6.00 each. We will select and send to you high only quality pendants that we are proud to call WilStone Creations product. No discount sales on second rate products here, just fantastic prices in bulk with free shipping included. These stunning natural looking pendants feature Lake Superior Agates in a free form style cabochon. All stones are cut flat and polished however, the sides are the outer natural edge of the stone.